It is easy to find your way to us. If you feel uncertain, route descriptions to our main office and exhibition grounds are available. When you arrive at Ätran, take the road towards Varberg. When you see the petrol station on the righthand side, turn onto the road to the right (Timmervägen). Then follow the road up to us. When you see the petrol station on your righthand side, turn onto the road to the right (Timmervägen). Then follow this road up to us. After having crossed the river Ätran look for the petrol station to the left. When you see the petrol station, turn onto the road to the left (Timmervägen) Then just follow this road up to us. When you are approaching Ätran, look for the road Timmervägen to the right. Follow this road up to us. If you miss this road, take the road towards Varberg on the crossing inside Ätran. When you then see the petrol station on your righthand side, turn onto the road to the right (Timmervägen). Then just follow this road up to us. At Ljungby we entertain an exhibition ground where we show our machines. To find it turn off at the southern access road to Ljungby. The first road on the lefthand side is the Ringvägen. 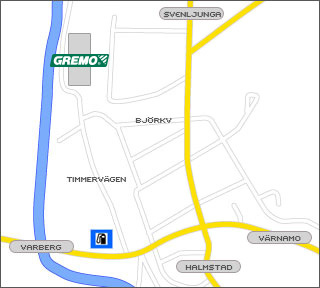 After approx.500 metres you reach the Gremo exhibition ground on the lefthand side.